A colossal head of the Hercules Farnese, terracotta or Coade Stone. You are here: CollectionsOnline / A colossal head of the Hercules Farnese, terracotta or Coade Stone. 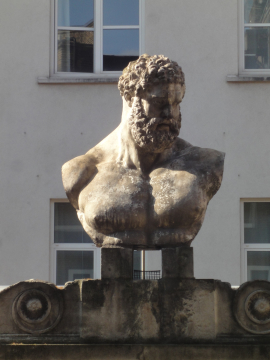 This head is after that of the celebrated antique statue now in Naples. The original statue which inspired this head was made for the massive Baths of Caracalla in Rome, probably at the time of their construction in the early third century AD. A Greek inscription on the base of the statue records that it was made by the Athenian sculptor Glykon who in turn probably based it on a celebrated earlier Greek figure made for Alexander the Great by the court sculptor Lysippos. The statue was excavated in the sixteenth century and was acquired by Cardinal Alessandro Farnese, hence its name. Today it is in the National Archaeological Museum in Naples (no. 280).